Now, when it comes to listing out the most graceful and responsible minister the country ever had, the first name that strikes every Indian brain is undoubtedly External Affairs Minister Sushma Swaraj. Since the very beginning of her entry on the social media platform Twitter, she has never shown her back for any helpless person abroad. 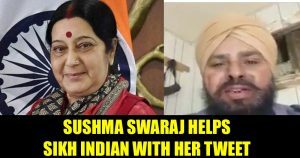 Thanks to technology, after all for bridging the gap between the victims and leaders, Sushma Swaraj is quite an amusing person when it comes to fulfilling her duties, this eminent lady responds to every tweet from the Indians abroad, promises help and she does it all the time, no matter whatever the situation might be. Coming to the story, a Sikh man from Saudi Arabia has posted a video regarding his company, which is not paying him his salary, he took on the video to urge any possible help from the Indian embassy. According to the video, this man (identity is not disclosed) said that he has been working with them for nine years, his son also works alongside him in the same company and the company didn’t pay the son’s and father’s salaries yet, the total amount of salary when summed up is nearly 35,000 Rial (roughly Rs 6 lakh) and the company also owes his son 17,000 Rial which is around Rs 3 lakhs when converted. The tweet went viral for right reasons, it received 630+ retweets and around 2,500+ likes till this moment. Now, such compassion for the duty is quite rare especially in Politics, as per the response from Indian embassy in Saudi Arabia it now appears like this man will get help for sure, maybe it just takes time.